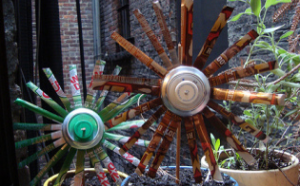 Decorated your winter gardens this year with DIY flowers made from recycled soda cans by CanarsieBK. 1- Use razor (and scissor if necessary) to cut off the top of the soda can around the ridge line. 2- Starting from the top of the can use your scissor to cut down about 1/8 -1/4 inch from the bottom. 3- Make cuts all the way around the can. Get creative with the cuts if you’d like by zig-zagging. Once all of the cuts are made. Fold all of them outwards. 4- Take the drill or nail and poke a hole in the bottle cap and the bottom of the can. 5- Fish string through the hole of the top of the bottle cap and continue it through the bottom part of the can. 6- Tie knots on either end to loosely secure the bottle cap to the can. 7- Tie a stick to the opposite side of the soda can that the bottle cap is on. Fun. What a creative way to reuse a product. I think using recycled equipment is another good way to reuse something to help our enviornment.